Improper use of the cruise control can lead to a crash. 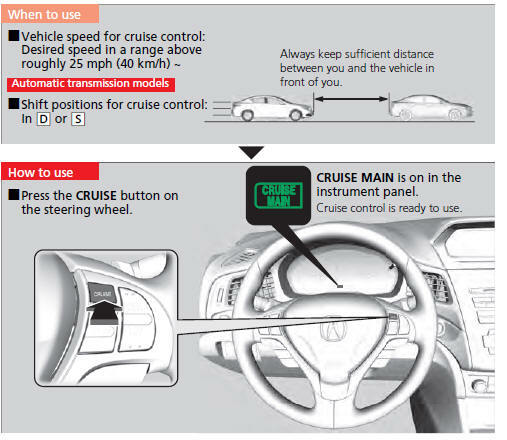 Use the cruise control only when traveling on open highways in good weather. It may not be possible to maintain a constant speed when driving uphill or downhill. 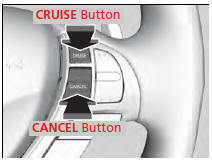 When not using cruise control: Turn off cruise control by pressing the CRUISE button. When the engine speed slows down, try to downshift. You can maintain the set speed if you change gear within fives seconds. Take your foot off the pedal and press the DECEL/SET button when you reach the desired speed. The moment you release the DECEL/SET button, the set speed is fixed, and cruise control begins. The CRUISE CONTROL indicator comes on. • Each time you press the button, the vehicle speed is increased or decreased by about 1 mph (1.6 km/h). • If you keep the button pressed, the vehicle speed increased or decreased by about 10 mph (16 km/h). To cancel cruise control, do any of the following: • Press the CANCEL button. • Press the CRUISE button. • Depress the brake pedal. • Depress the clutch pedal for five seconds or more. The CRUISE CONTROL indicator goes off.